Is a Disney Cruise for adults? 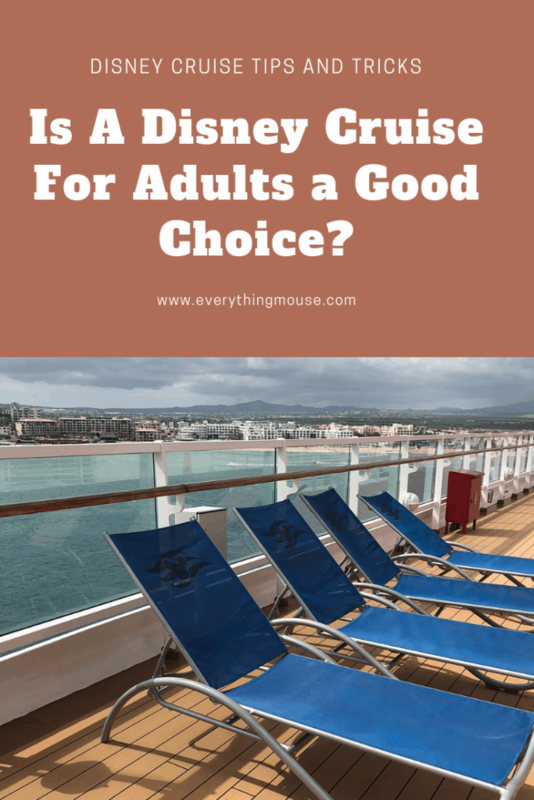 We all know that the kids are going to be happy but what does a Disney Cruise offer for adults? Plenty! 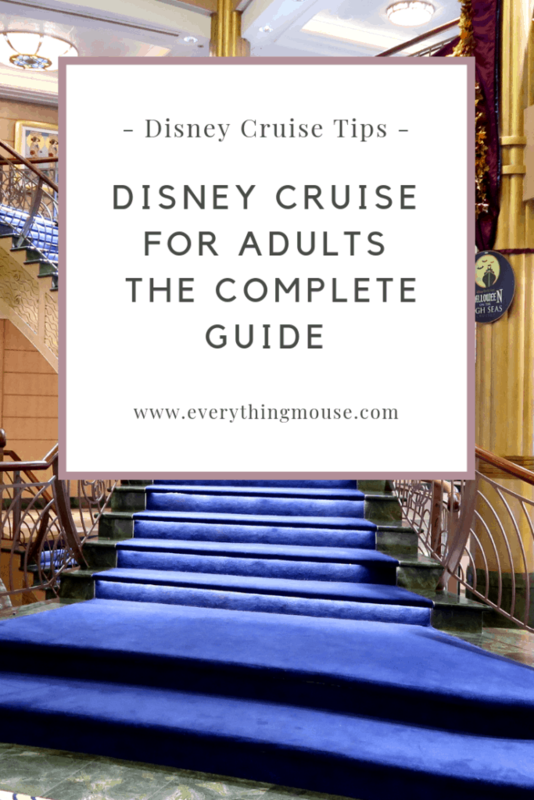 Whether you are adults traveling with children or sailing with just grown ups a Disney cruise really can be a dream vacation. There are so many things to do on a Disney cruise for adults. Join my Disney Cruise Group for Tips and Free Giveaways! Right now there are four Disney cruise ships. The Disney Magic and the Disney Wonder are the classic ships. The newer ships are the Disney Fantasy and the Dream. They are known as the Dream Class Disney ships. 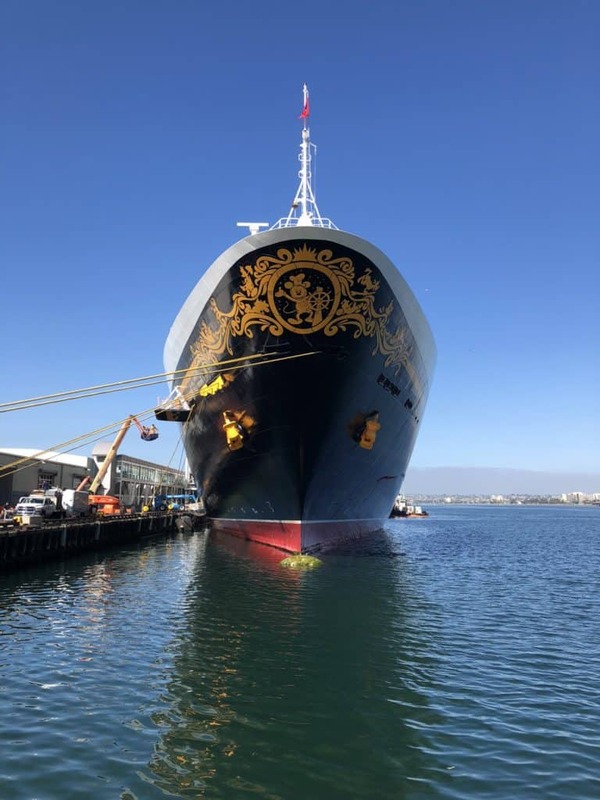 The Classic Disney ships have 11 decks and can accommodate up to 2,400 guests in 875 staterooms. 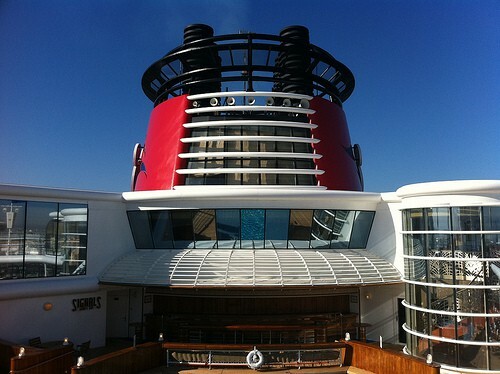 The Disney Fantasy and Dream are significantly larger than the Classic Disney Magic and Wonder. 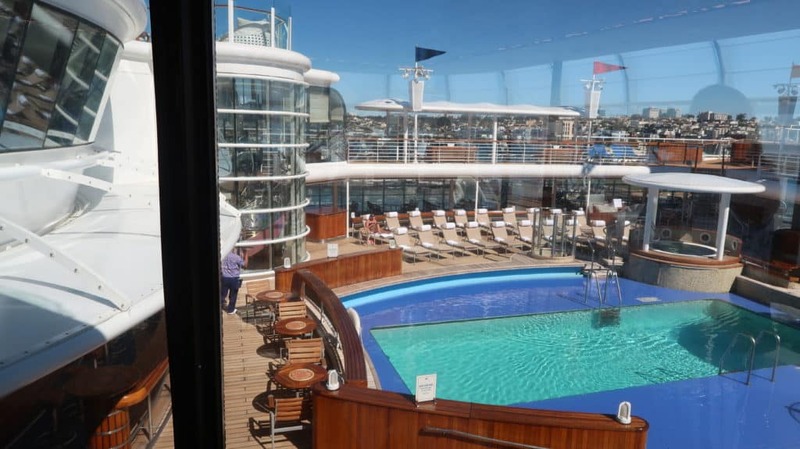 They have 16 decks and can accommodate up to 4,000 guests in 1,250 staterooms. There will soon be three new Disney Cruise Ships. 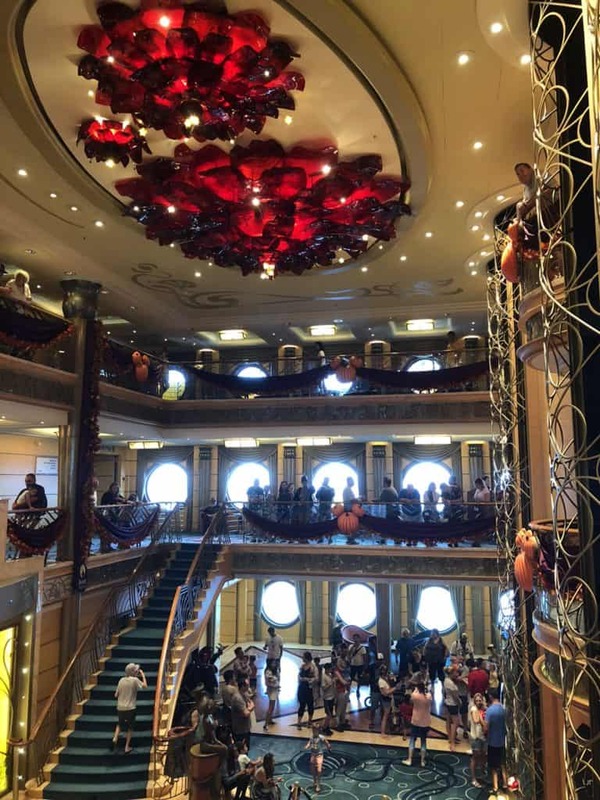 Which is the best Disney cruise ship for adults? This doesn’t have a straight forward answer! All of the Disney ships have great entertainment, service, dining options and adult only areas and activities. The Disney Fantasy and Dream are larger ships. They each have a very large area devoted just to the adults. This extends over 2 decks and includes an adult only pool, a bar and an adult only cafe. The smaller ships also have areas which are exclusively for adults. If you feel that you will prefer a smaller ship you should try either the Disney Wonder of the Magic. There is no easy answer to the question of which is the best Disney cruise ship for adults. They are all fabulous choices. We all have times when we just want to spend some kid free time. 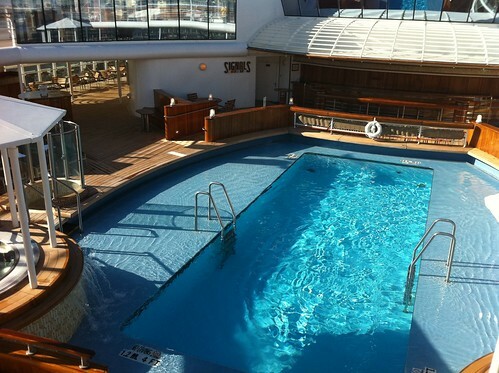 The Disney Wonder, Magic and Dream all have an adult only area which centers around the Quiet Cove pool. The pool is open to the over 18s only. The adults only Quiet Cove Pool is a great place to spend some very relaxing time. There are crowded times such as sea days. However, if you want a quieter time then port days are a good bet mornings and early afternoon in particular. Most people are off the ship at this point when in port. Another quieter time tends to be around 5pm. Guests are either getting ready for dinner or a show. If you are on Late Dining and don’t want to see the show this is a particularly great time to enjoy some peace at the Quiet Cove Pool. On the Disney Magic and Wonder the pool is a maximum of 5 feet deep. It is heated to a very nice temperature all day. The Disney Magic and Wonder Quiet Cove Pool has 2 jacuzzis at the side of the pool. A nice feature of the jacuzzis is that they are shaded. The pool deck has plenty of upgraded sun loungers, and of course the Signals bar is right next to the pool. 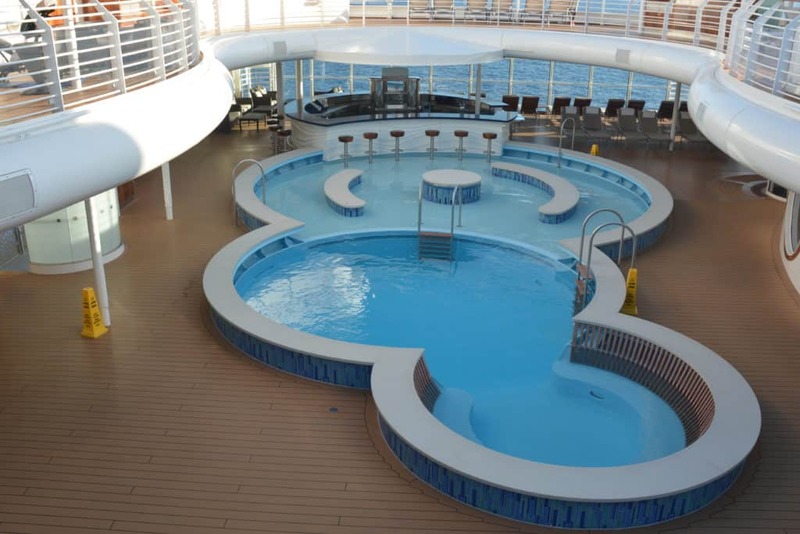 The Disney Dream and Fantasy have a very different pool design to the classic ships. There are two elements to the pool. There is a conventional pool. 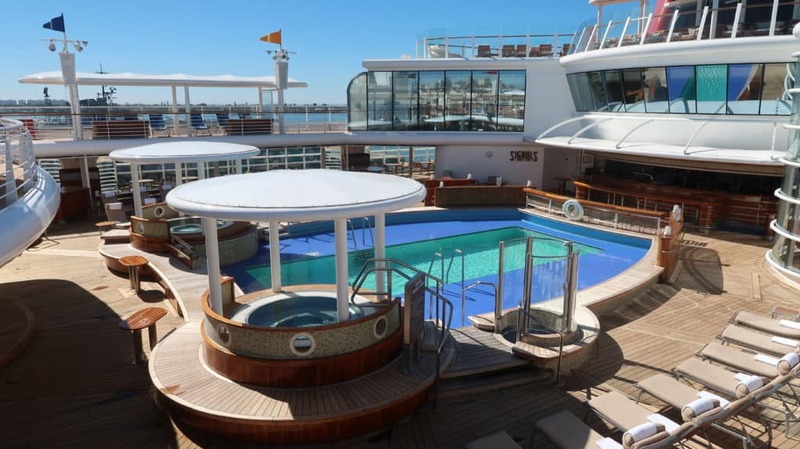 However, the Quiet Cove also features a 6 inch deep pool which has sun loungers and misters so that you can cool off and sunbathe. Needless to say this is a popular spot and is one of the popular things to do on a Disney cruise for adults. 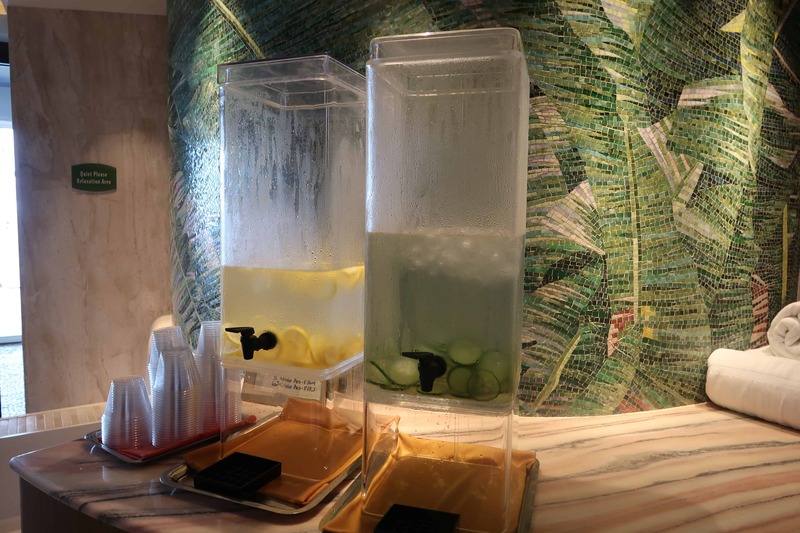 Here is our guide to the Disney Fantasy Quiet Cove Pool. For those who want a quiet relaxing place to sit and enjoy a cocktail, glass of wine, or a coffee, then the Cove Cafe is a place just for the adults too. Many cruise lines say that they have adult only spaces. However, I have experienced that some cruise lines do not particularly enforce this and you will often find that children find their way into the adult ‘sanctuary’. This is not my experience of Disney ships. The rules just seem to be adhered to and, save for the occasional child passing through it is rare to see the under 18s in any adult reserved areas on a Disney ship. Perhaps it is because there are so many spaces for kids why on earth would they want to enter the places where the ‘boring’ grown ups are! Palo is the fine dining adult only restaurant. 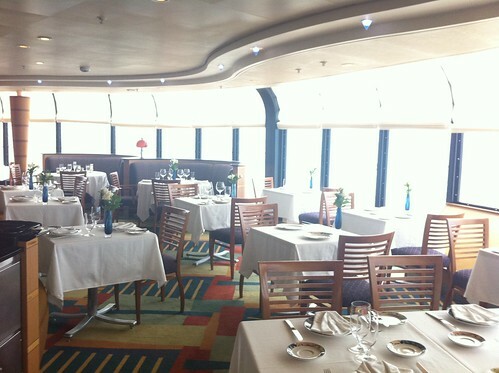 The Palo restaurant is found on all of the Disney cruise ships. 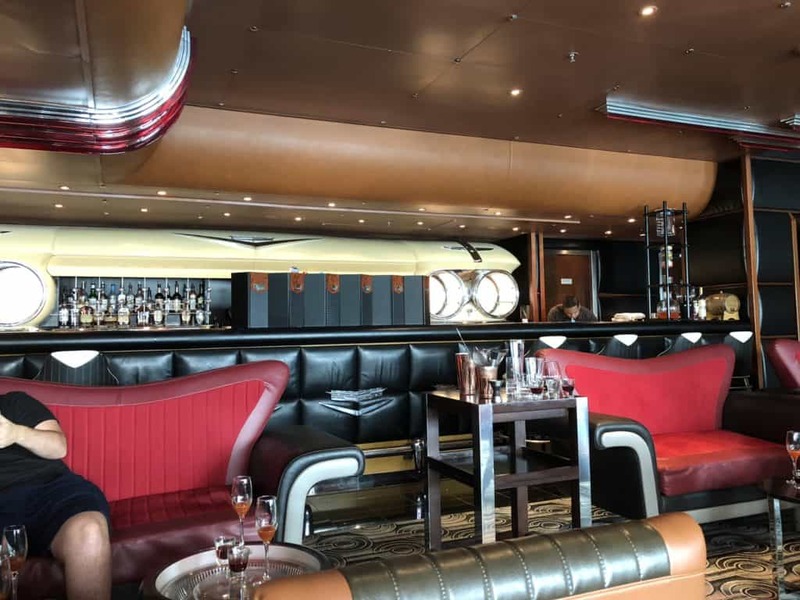 Palo is larger on the newer ships, but the menu and quality of service are the same. 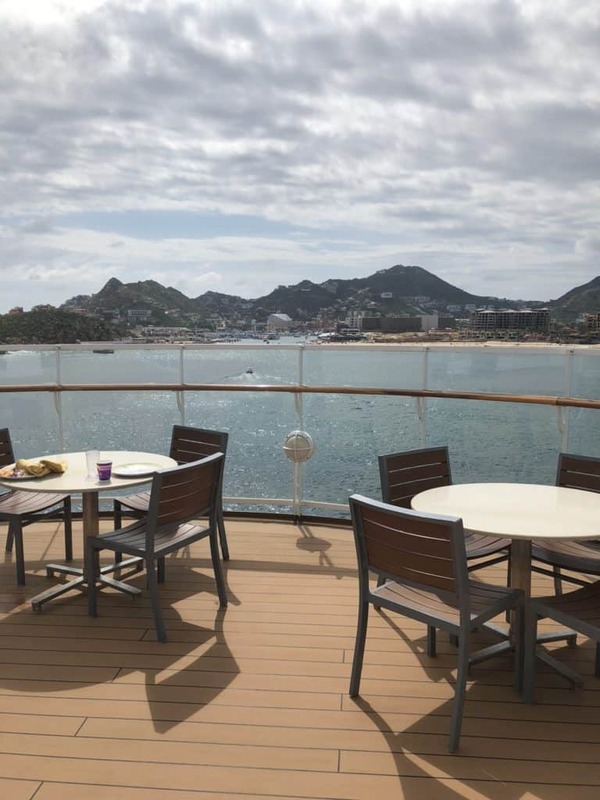 You really do need to experience a Palo Brunch or Dinner at least once on your cruise. If you have to choose which should it be. Palo Brunch or Palo Dinner? THey are very different experiences. Read our comprehensive guide to both which shows you just what to expect and which one is best. 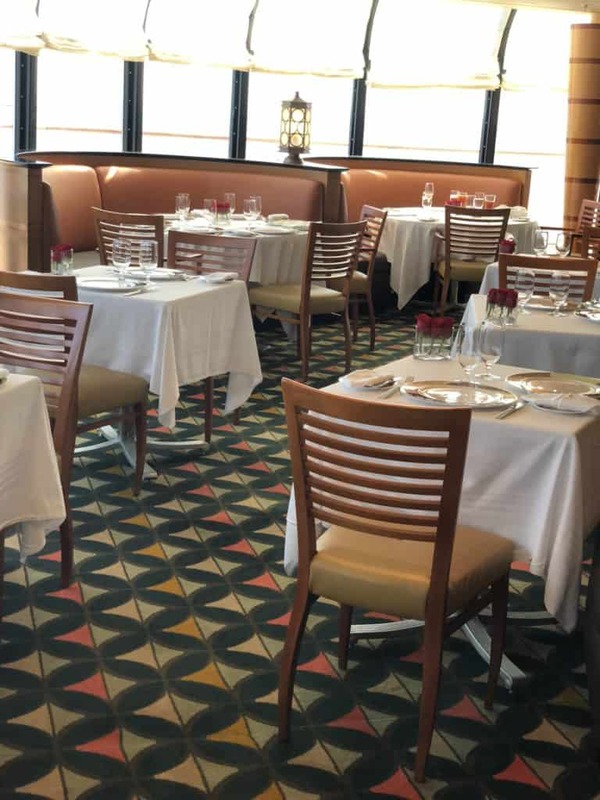 On the Disney Wonder and Magic, Palo is located on Deck 11 and seats 130 guests in a beautifully designed restaurant with an Italian theme. There is an additional charge of $40 per person for Palo Brunch and Dinner. 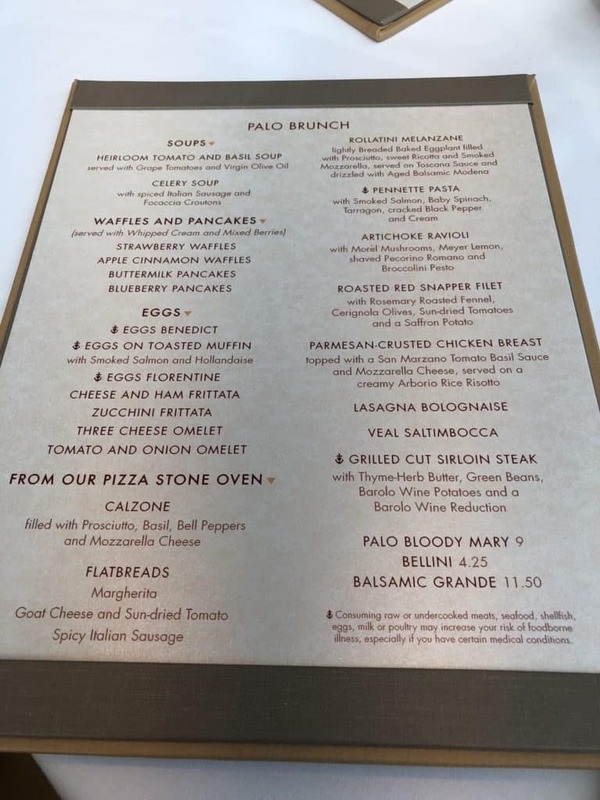 The Disney Palo Brunch menu has hot entrees which you can order a la carte. 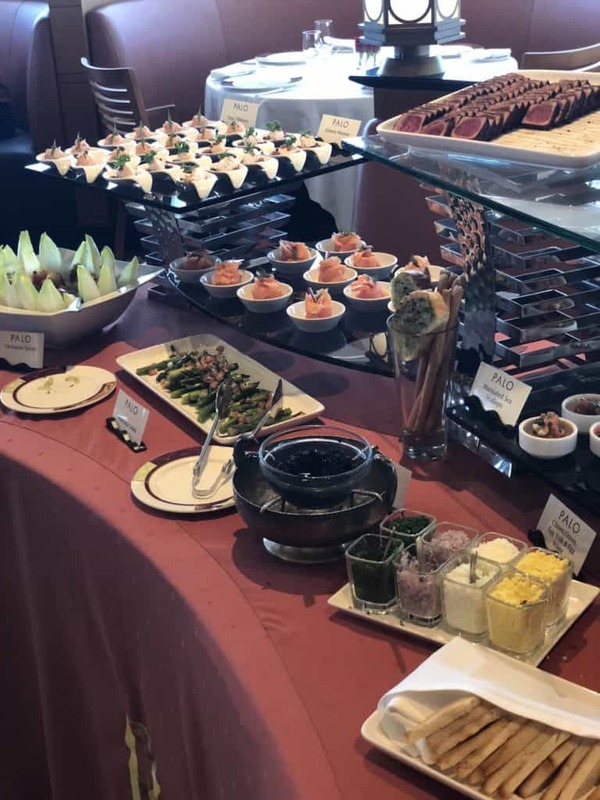 The real attraction of Palo Brunch is the buffet items. There is a huge selection. You will be sure to find something that you enjoy. Disney Palo is on Deck 12 of the Fantasy and the Dream. 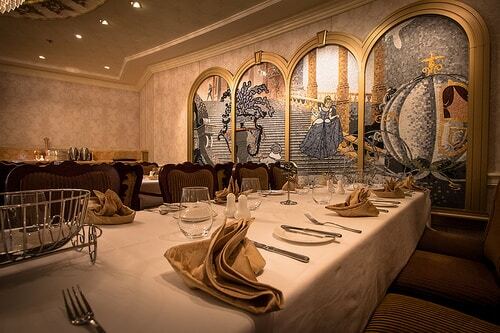 The restaurant is larger than on the Classic Disney Ships, but it still has a cozy romantic atmosphere. Some of the tables have a fabulous view of the ocean. 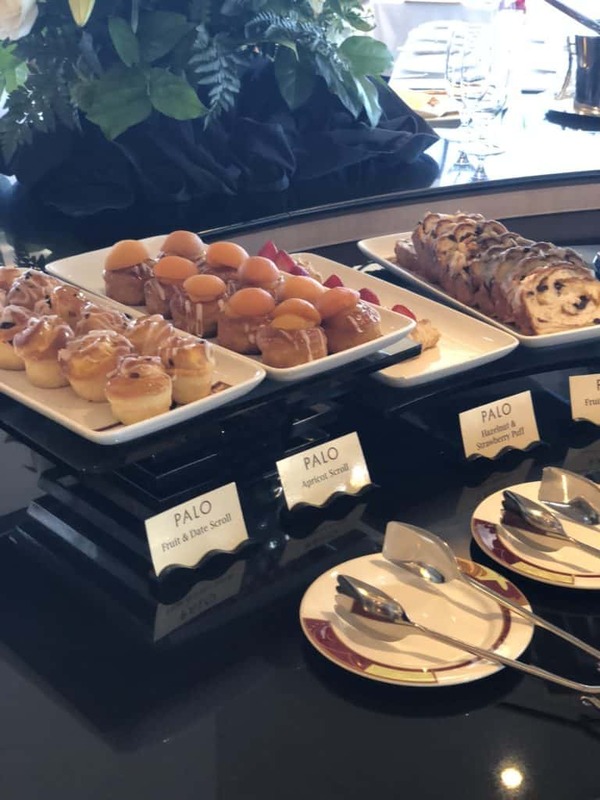 It is very difficult to resist the Palo restaurant desserts! 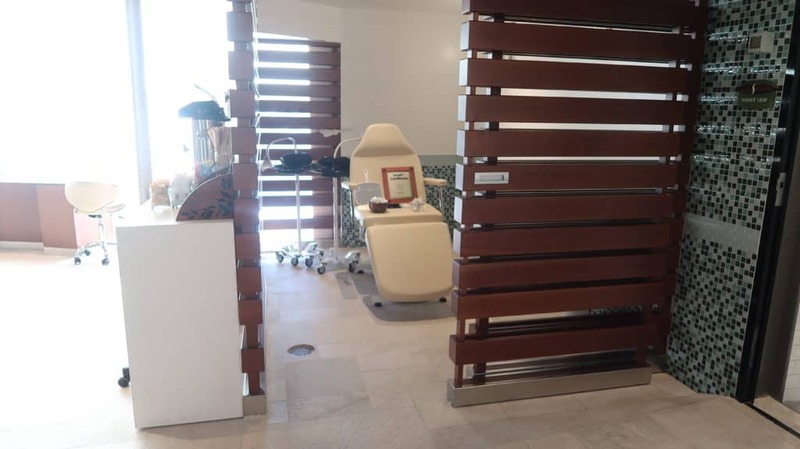 Another one of the popular things to do on a Disney cruise for adults is to visit the Senses Spa and Salon. 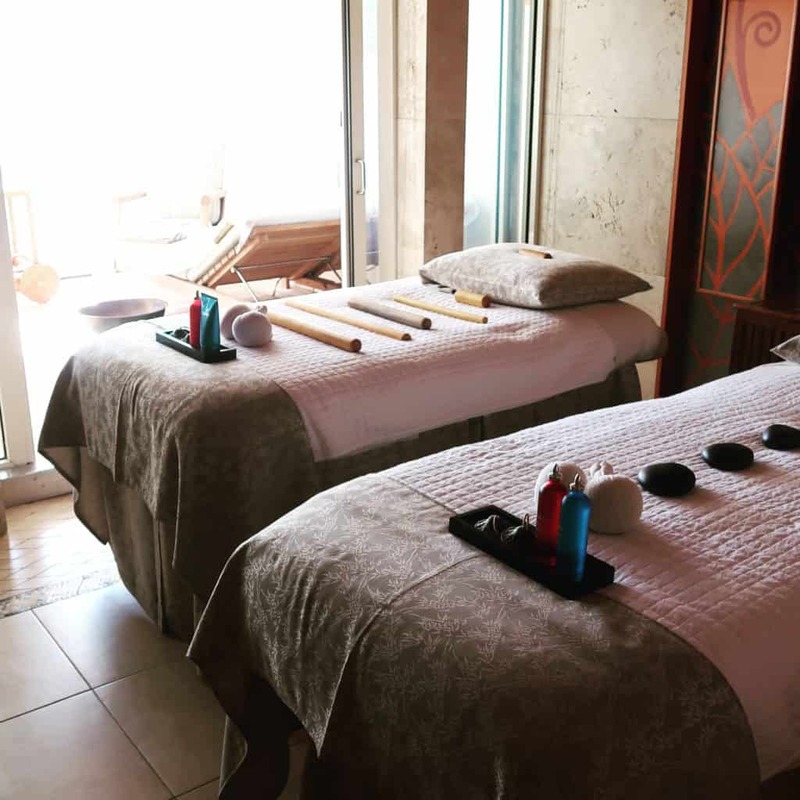 Even if you don’t usually indulge it can be fun to book a spa treatment on a Disney cruise. 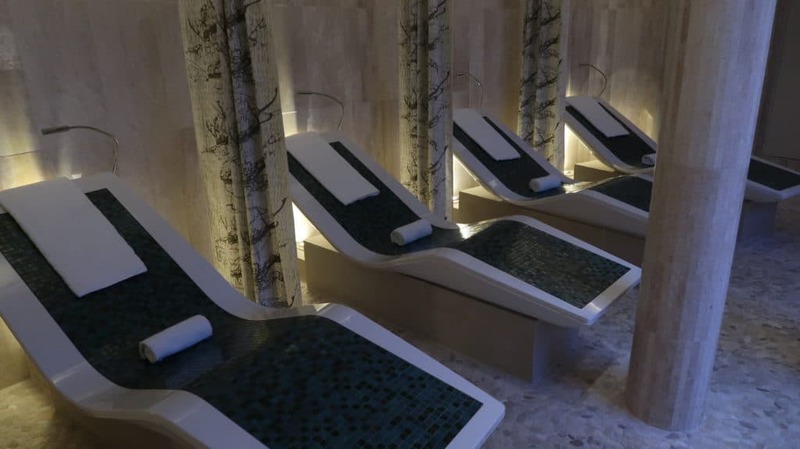 Offering the usual range of spa and salon services as well as the Rainforest Room. If you are looking for the ultimate in relaxation then a visit here is a must. 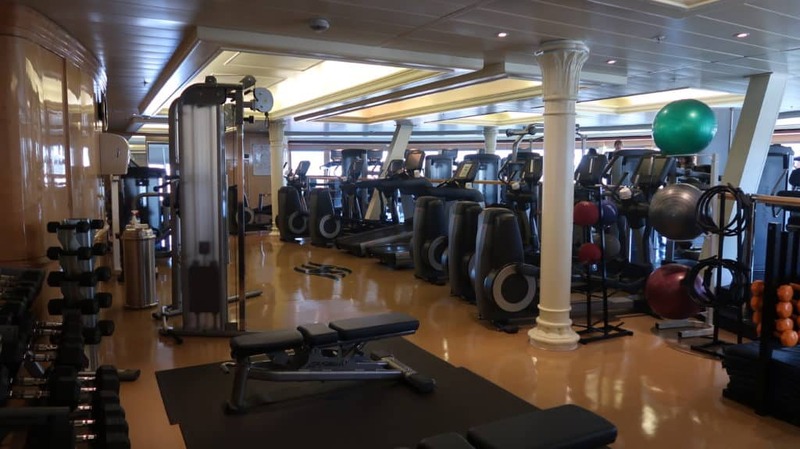 The fitness area on the Disney Wonder and Magic is smaller than on many cruise ships of similar size, However, it has a good range of equipment. Classes are also offered each day. The fitness center is open to the over 18s only. The gym on the Disney Dream and Disney Fantasy is larger than on the classic ships. However, it never seems less crowded because of course there are more guests on the ship. Always look out for Day at Sea deals in the spa as you can often get a discount on a package of treatments. The Rainforest Room is part of the Senses Spa. Even if you are not particularly a “spa person” you should think about getting a pass to the Rainforest Room. It is one of my very favorite features of a Disney cruise. You can read my full Disney Rainforest Review for a complete guide so that you can see if you want to indulge. The Rainforest Room on the Disney Wonder and Magic has a steam room, sauna and aromatherapy showers. The best feature is the heated stone chairs. The Rainforest Room on the Disney Fantasy and Dream is much larger than on the Classic Ships. 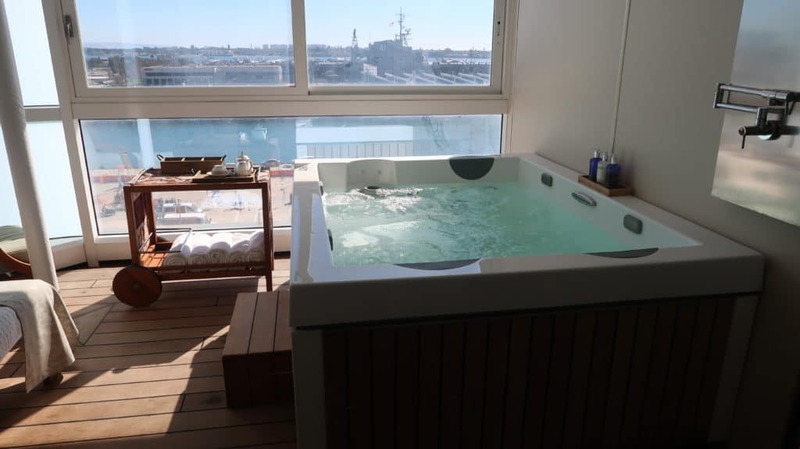 It is located at the front of the ship and the area with the stone chairs and the jacuzzis has a fabulous view of the Ocean. You can even see the ocean from the sauna! Whilst I much prefer the design of the Rainforest Room on the newer ships, I always get a pass for the Rainforest on the Wonder and Magic too. Perhaps unfairly, the price for all of the ships is the same. However, if you think that you are going to enjoy the Rainforest the length of cruise pass is a better value. There are individual passes and couples passes available. You can also buy a Day Pass for $16 or a Deluxe Pass for $27. The Deluxe Pass includes a scrub. This is a nice feature but I think that $11 is way too much of a premium. If you are sailing on a Disney cruise for adults you really should at least try one day in the Rainforest Room. 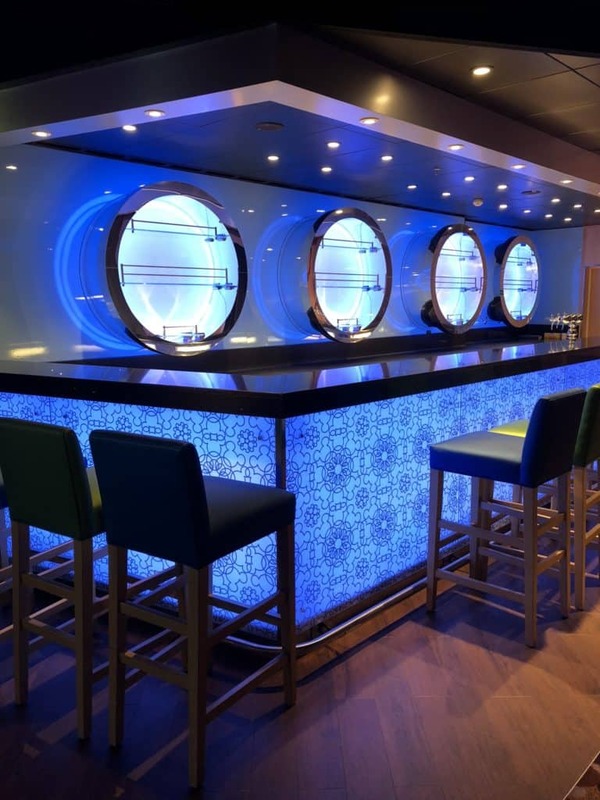 On all of the Disney ships you will find a number of bars and lounges to enjoy. Some are family friendly but most are adult only after 9pm. Don’t sail on a Disney cruise expecting a wild night life. That is simply not what Disney is about! However, there are many places to enjoy a drink, sit back and relax and listen to live music. Disney also has one of the most relaxed policies at sea when it comes to how much wine you can bring on board from home. Each adult can bring up to 2 bottles of wine or 6 bottles of beer on board. 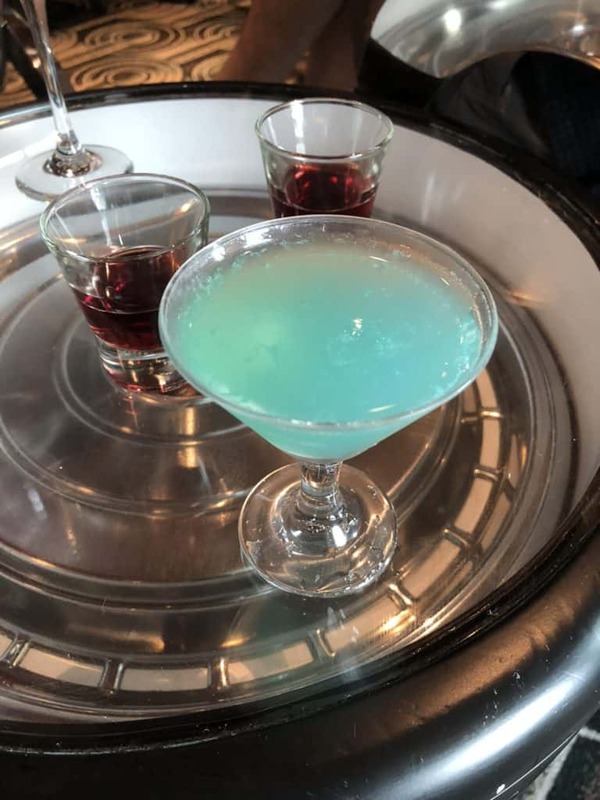 Here is our complete guide to Drinking On A Disney Cruise. 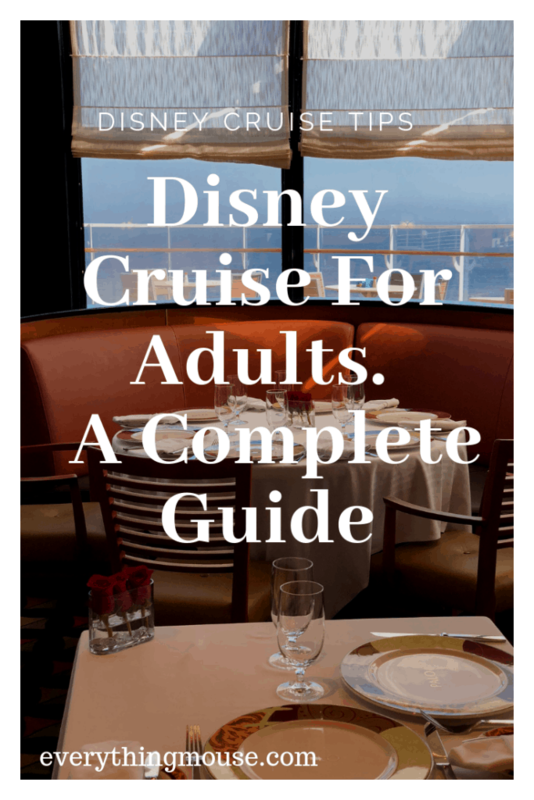 You will not be short of things to do on a Disney cruise for adults. Disney ships always have a strong and varied program of activities for the over 18s only. There is the traditional wine and drinks tasting. 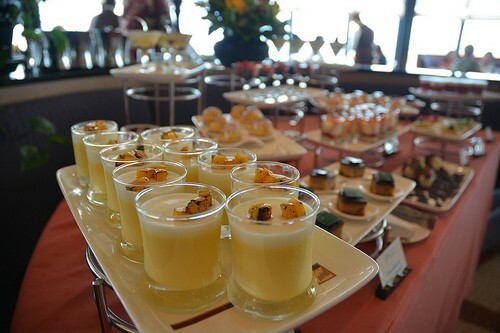 We had a great time at the Mixology Class on the Disney Wonder. The Art of Entertaining talks where a chef shows you how to prepare a dish featured in one the Disney restaurants. The Disney Behind the Scenes talks are particularly informative and enjoyable. On one Disney Wonder cruise I particularly enjoyed the presentations by Leslie Iwerks. She is the grand-daughter of Walt Disney’s business partner, Ub Iwerks. He was an exceptional animator and the now acknowledged creator of Mickey Mouse. As well as all of the over 18s only areas and activities there are so many things on the ship which adults will enjoy. 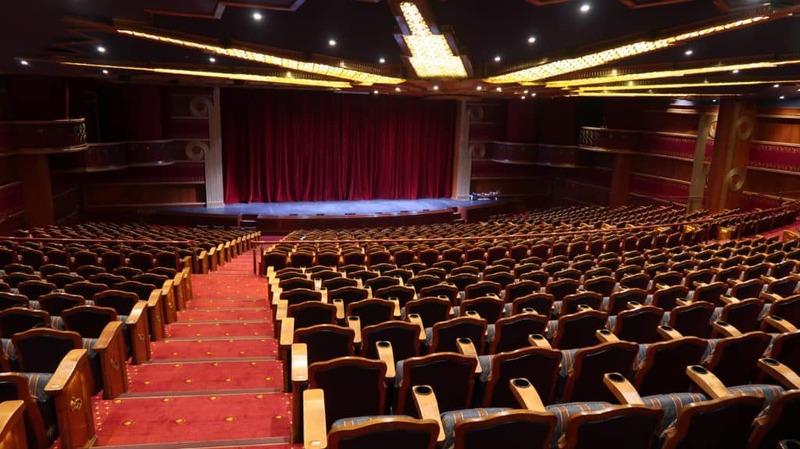 Disney has the best stage shows at sea. They are so superior you really will struggle to watch most others when you have experienced Disney. The Disney cruise stage shows are for all ages. There are also some late night adult only performances by different variety acts. If you are a movie fan then you will find something to watch in the Buena Vista Theater. Disney shows it’s movies all day and evening, and often shows new release and even premiers its own movies onboard. 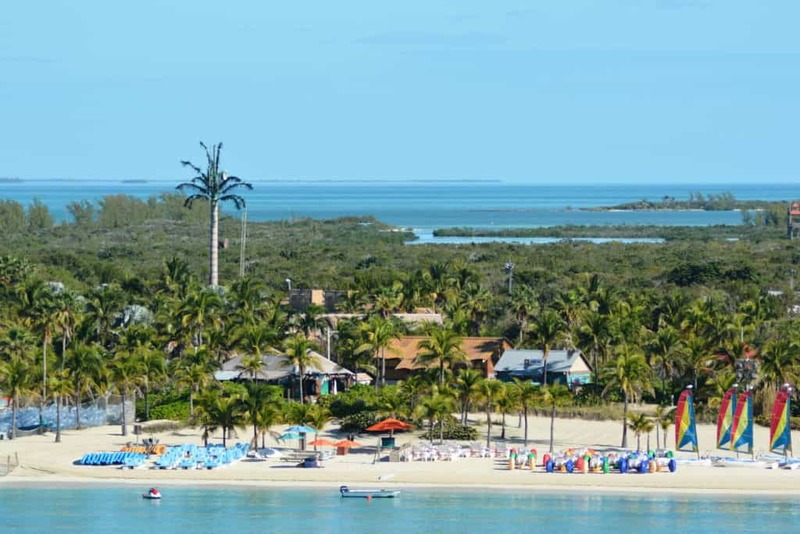 Castaway Cay is Disney’s very own private island. This paradise in the Bahamas is the highlight of many Disney cruises. 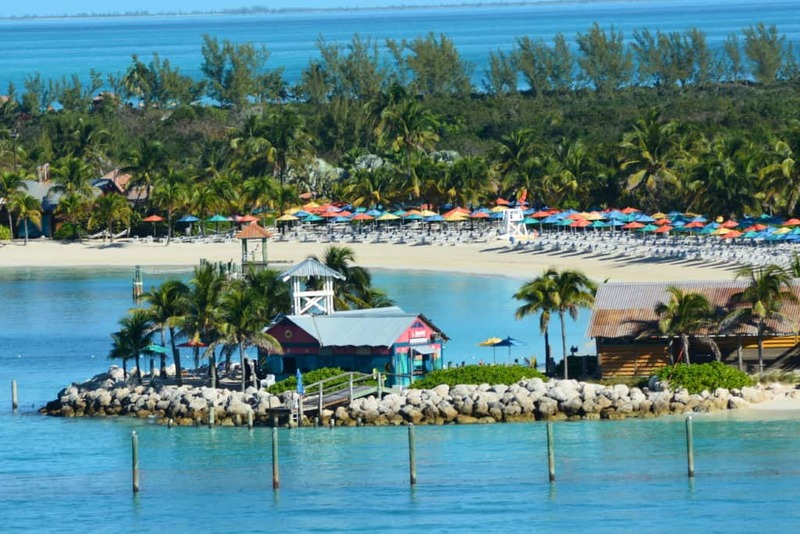 Most of the Disney Caribbean and Bahamas cruises have a port stop at Castaway Cay. However be sure to check that you Disney ship sails to Castaway Cay if this is big part of what you wish for on your cruise. Disney is also planning a second private island which will be used in addition to Castaway Cay when the first of the new Disney ships is launched in 2021. Is a Disney cruise a good alternative for guests who do not have children coming along with them? Are Disney cruises fun if you are an adult with no kids on board? Disney is very much known as a family cruise line. However, it has a huge amount to offer adults traveling without children too. 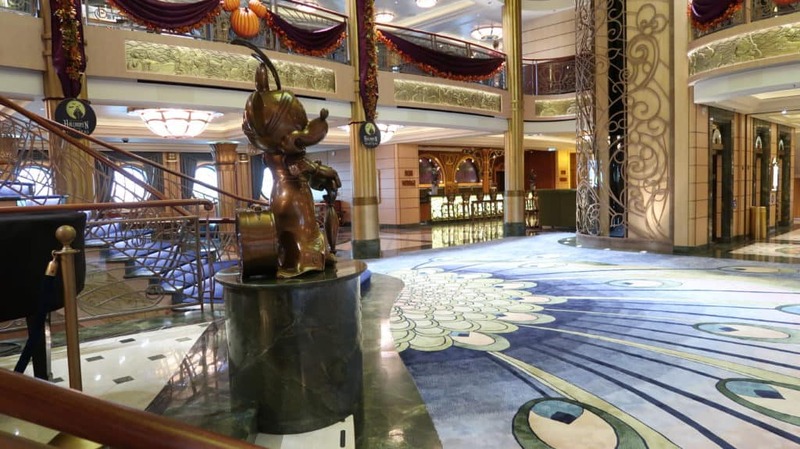 What is it like to take a Disney cruise without children? We recently sailed on our first Disney cruise without kids and would definitely do it again. It is very different without children, but Disney cruise lines has a lot to offer adults. 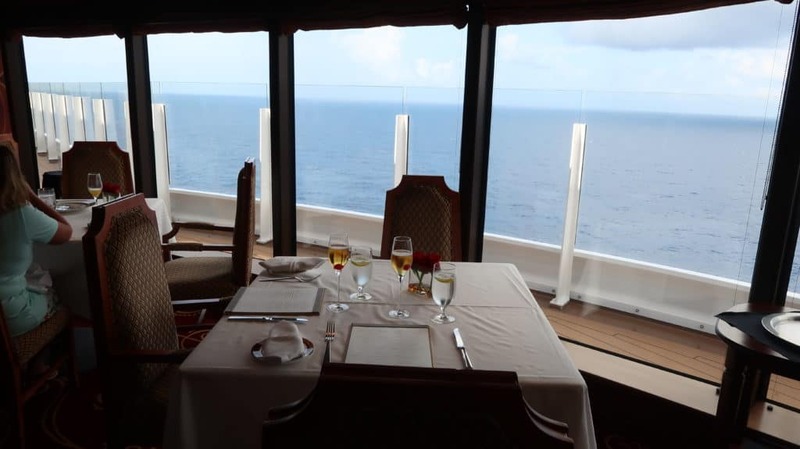 The quality of the Disney cruise ships, the beautiful staterooms, the itineraries, the entertainment.the dining, service and Castaway Cay all make it a wonderful cruising experience. We have sailed with other cruise lines but Disney always comes out as the best. In my view it is possible to go on a Disney cruise if you do not particularly know anything about or even particularly enjoy Disney. You can walk around the ship and forget sometimes that the whole environment is built around the Disney theme. Yes really. Mickey Mouse is not going to approach you unless you approach him! Really a lot of the magic is because it is what it is. Disney. So if you actively dislike the Mouse (apparently there are such people) then of course this really isn’t for you. However, if you are a Disney fan, or even curious to know what all the fuss is about, then this could be the ideal cruise experience for you. Will you be sailing on a Disney Cruise for adults? How Do You Get to Stay in Disney's Cinderella Castle Suite? Is There a Disney Cruise Drink Package? The Everything Mouse site is not affiliated with, endorsed by, or in any other way associated with The Walt Disney Company. For official information about Disney you should visit Disney.com. 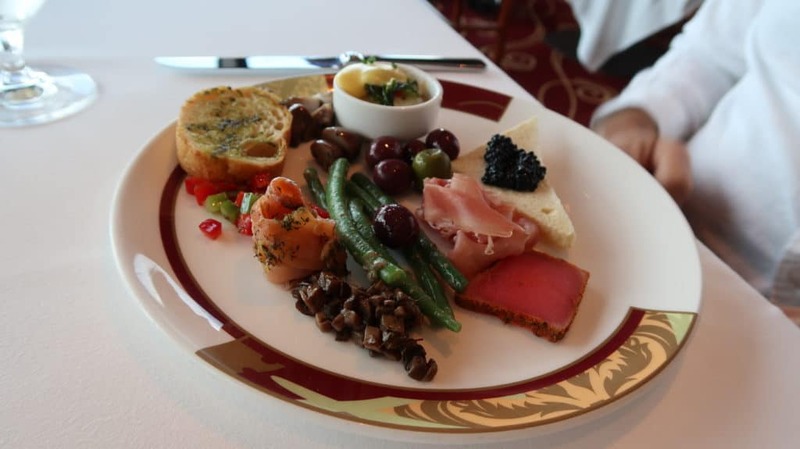 Disney Cruise Royal Court Royal Tea – Is It Worth It? Disney Monorail Hotels – Which Should You Avoid?